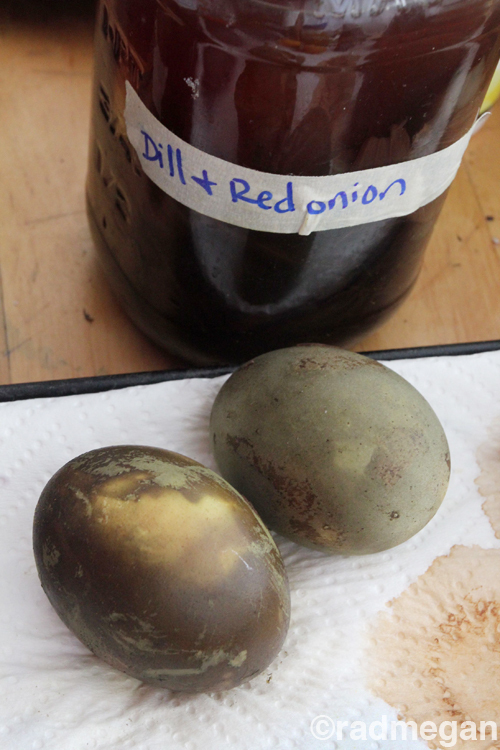 Last week I shared a sneak peek of some eggs I’d dyed using all-natural ingredients. This project came about when the television show, The Doctors contacted me to see if I would be interested in coming on their program to share ideas for natural dyes! I was honored and STOKED that they had reached out. And even though my segment was cut way, way down (so far down that I’m not even in the segment- it’s really just a cameo of my eggs…) I wanted to share the full recipes for each of the dye colors I made. A lot of natural dyes take quite a bit longer to set than chemical-based commercial dyes. When I used dry ingredients such as Turmeric, tea or cabbage leaves and instant coffee, I always started with a room-temperature egg (to prevent cracking during the boiling process) in a small sauce pan with two cups of lukewarm water. I wanted to set a constant for my dyes, and 2 cups liquid was it! I would bring the liquid to a boil and cook the egg for at least 11 minutes, sometimes a bit longer. I used white vinegar as my mordant. During my first few dye jobs, I omitted the vinegar, and found that the color didn’t hold as well. When the eggs were cooked, and I was confident that the color had begun to release from the dyeing agent I was using, I would remove the egg(s) from the saucer, and pour the hot liquid into a glass mason jar. Then I would carefully lower the egg into the jar, being sure it was covered completely. I let the jars cool on the counter, and then placed them ALL in the bottom shelf of our refrigerator overnight. When it was time for the unveiling the next morning, I was thrilled with the unexpected colors! I had read that natural dye can leave an egg looking dry and that you could give your egg a little gloss using mineral oil! A trick I used and VERY much enjoyed! This blue was my personal favorite! It should be noted that red cabbage is a PH indicator, and that it creates carbonation when combined with the white vinegar, so you will want to open your jar of cabbage dye at least once a day to release the gas build up! Turmeric REALLY stains everything so be careful when you use this stuff! …and how this onion & carrot top egg looks like scorched earth! Adding the mineral oil polish to some of the eggs really did provide amazing textural contrast to the ones I left in a natural matte finish. When I dyed this egg in half white wine and half red (the cheapest Trader Joe’s carried) these INCREDIBLE crystals formed all over the surface of the shell. 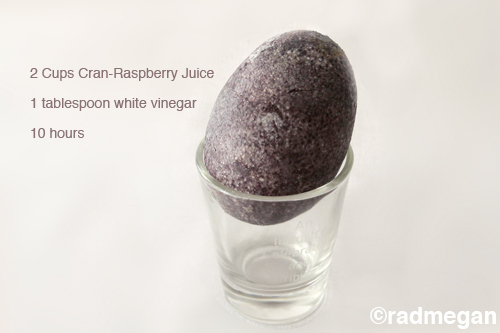 It looked like a snow-encrusted version of the cran-raspberry egg! I tried dyeing an egg in straight red wine and got the same crystal-formation with a more plum colored egg! If anyone can explain the science behind this, I would LOVE to know! Using red onion skins gave off a beautiful mottled red and turquoise look. Straight dill seed, water and vinegar came up with this really nice lemon-lime color. I love that some of the eggs came out of the dye with an overall, even color, while others were very textural and almost looked scarred. I was surprised that beets didn’t give me enough of a pink hue to really want to share with you- they sort of made white eggs just look like brown eggs. Aside from that, there were no disappointments in the whole lot! One more note about vinegar and eggs… if you allow your eggs to soak in a natural dye with MORE than a tablespoon of vinegar, the shell will begin to soften overtime. It’s both cool, and gross! If anyone has anything to add about natural dye, or if you have any questions, please leave them in the comments below! I feel like I could write a book on dyeing eggs with all-natural materials now! 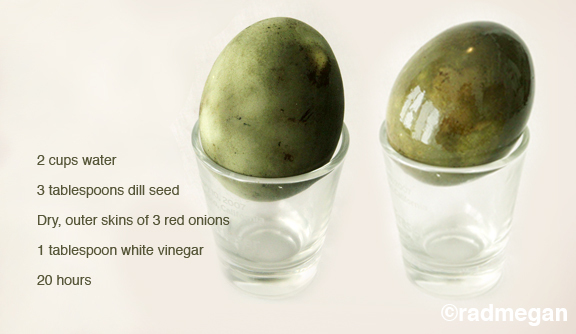 Oh- and coming soon- a great and natural way to decorate the eggs that do crack in the cooking process… stay tuned!! What’s the word on how permanent the dye is? Do you think the eggs need to be sealed with something and, if so, maybe the mineral oil will work? Pretty darn permanent! 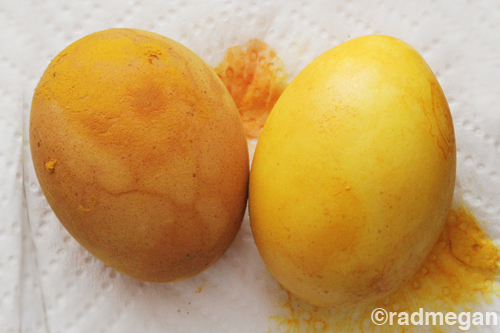 I tried to rub off the dyes after the eggs had dried completely…no luck. It got me thinking that I should use my egg dyes for fabric. I wouldn’t seal the eggs unless you blow out the insides before dying them… just because if you do plan on eating them, you wouldn’t want the fumes/chemicals from a sealer in your food. If you want the shine and the taste, try olive oil to gloss them up! Let me know how yours turn out! Thanks for reading & commenting! These are so beautiful! I’m thinking a little random gold leaf on some of those might be nice. The oil will make it adhere. Thank you! Will try with this year’s eggs. How cool!!! gosh those are awesome. Thank you Christi and Devon!! Wow, gorgeous! Who knew cabbage leaves could do that?! Thanks so much! I know! We should dye some yarn or riving next! Wow! Thank you for that effort! I have been looking for a way to dye my eggs naturally this year and I am so happy to have found your post! Would you mind if I present it to my readers, hoping to inspire them to do the same? Amazing! Thank you for the nice comment!! Awesome! Thank you! In fact, I already sent you an email because I didn’t expect you to be here right now The magic of Internet! Have email suscribed, followed and linked. oo – question – how long might you say you could keep using the solutions you made before it goes mucky? I tend to use my tea/coffee a few days in a row to get the most paper done as I can… and the colour intensifies with every passing day, with awesome sedimental effects too. Thanks Jane! I hope you do!! This is so cool! I cant wait to try this with my girls! I will link to your tutorial for sure! Oh my, will my 2 little grandsons get into doing this. (So will Grandma!) Thanks bunches! This is too cool! The colors of the eggs turned out beautiful! These look lovely! Just out of curiosity, did the “flavor” of any of the dye ingredients soak through the shells and into the egg itself? After 10-20 hours of soaking, I could see that happening with some of these dyes. I saw this on the Drs. show and just happened upon your blog. Kudos!! i love all the colour and texture. I wonder if olive oil or another food grade oil would provide the shine and still be edible? I would say that yes, coconut oil or olive oil would be great to use instead of mineral oil. I just stumbled on your blog through Pinterest. These eggs are magnificent! Welcome! Thank you so much Gwen! I would avoid mineral oil, especially if doing this with kids. Rather you could use one or a combination or coconut / olive oil, with or without some beeswax. The three together are something I have on hand for furniture polish and hand balm! Beautiful eggs. If you use the dyes on fabric, though, be aware that natural dyes often don’t hold up as well to washing… use cold water and a gentle cycle, and don’t dry them in the sun. Turmeric in particular is not UV-stable and will fade rapidly when exposed to sunlight. Fantastic! Thx for sharing this, I will try some of them. Ha! Maybe “Two Buck Chuck” is a great deal! It sure makes lovely eggs! Thanks for the info!! Wow! Amazing! Thank you so much for posting this and showing so many photos w/ the instructions! I like the Turmeric and the red cabbage ones especially!! I’m going to have to try this! Thanks again! Thanks so much for sharing this! We tried it with my boys for Easter (we had * just * enough time). While we didn’t get the textures that you did, they were certainly gorgeous colours! Did you leave the ingredients in the water when you put them in the jar? Also, we ate about half of ours, and they didn’t seem to be flavoured at all (we tried them straight, and as egg salad) – though some of them had colour. RadMegan, your eggs are rad! Question: I want to blow out the insides so I’m planning on dying the eggs uncooked (then blow them out afterwards). Any reason you think this might not work as well with the dyes as when they are boiled with all the ingredients? Correction: I’ve blown out the eggs and am trying to figure out if I should put the empty shells in while the dyes boil (like you did when you hard boiled the eggs), or just afterwards in the jars? Will it still take? What do you think? I would like to know this as well! Thanks for posting! I have found that blown out eggs float in the dye and don’t submerge….looking for a way to work.around this? Any suggestions? What a fantastic updated way to dye eggs. I shared your link for others to view your many ideas for Easter egg dyin. I will be doing this with my kids, some in a shorter time and they will be scientifically learning how the time of soaking can affect the color of the eggs. Thank you! Hello! The colours got out so beautiful, I want to try it to paint the Easter eggs! I’m curious about the quantity of water, how much is a cup of water you used? Also, if dill instead of dill seeds works for obtaining the yellow colour? Thanks! the hero’s beau, same applies to a site that’s been stuck in Google‘s naughty corner. de-indexed by Google, causing chaos in the internet marketing industries. I’m a little confused by the directions and very excited to try these natural dyes. Do you actually bowl the eggs in the solutions then tore them in the jars with the same solution? Or rather do you bowl the eggs as normal and then just store them in the solution. Can’t wait to try these dyes. I was a bit confused as well, and would love some clarification, so tagging along with this post! So are there any that would be good for kids (cuz Lord knows they aren’t going to want to do a 20hr waiting project lol)? & also does the boiled egg then taste like what you used? The eggshell is made of calcium carbonate. When calcium carbonate is exposed to an acid (ie. wine, vinegar etc) it will form crystals called calcite.